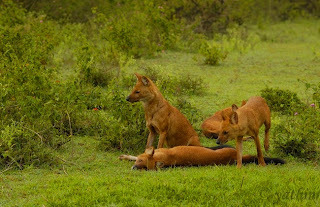 True Wild Life | Dhole | The dhole (also known as the Asiatic Wild Dog, Indian Wild Dog and the Red Dog) is an endangered wild dog native to the jungles of Asia. Although the dhole is very similar in appearance to the African Wild dog and the Bush dog, the dhole is the only member of it's genus. 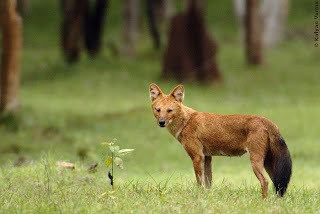 Historically, the dhole was found though East and Southern Asia, from the Russian far east right down to Sumatra, and although today the range of the dhole has been significantly reduced, the dhole inhabits a wide variety of habitats including thick, deciduous woodlands to jungles and tropical rainforests. There are three different species of dhole that are very similar in characteristics and only really differ in location and fur colour. Although a dominant predator within their environment, the dhole populations have been heavily affected by disease introduced by domesticated animals such as cats and dogs. Like other medium-sized canines, the dhole is a highly sociable animal that spends it's life as part of a pack. The dhole is well-known for the vocal calls that it uses to communicate with it's pack. It is said that the repetitive whistles of the dhole are so distinctive that individuals animals can be easily identified by their calls. The dhole is a carnivorous and fairly dominant predator within it's natural environment, working as part of a pack to try and bring down larger prey to feed the whole group. The majority of the dhole's diet however is made of smaller animals including lizards, frogs and rodents. Due to the dominant nature of the dhole and the fact that it often has protection from it's pack, there are few animals that are of any threat to the dhole in the wild. Large wild cats such as tigers and leopards are the only natural predators of the dhole, as the biggest threat to the world's dhole populations has been from humans. 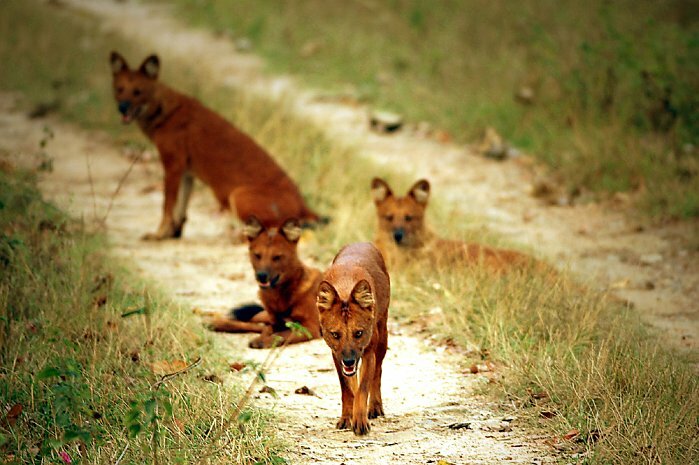 After breeding, female dholes give birth to between 5 and 12 pups after a two month long gestation period. Dhole pups grow rapidly and are cared for by both their parents, and by other adult dholes in the pack. The dhole pups begin to hunt when they are a few months old and reach adult size by the time they are about a year and a half old. Today, the dhole is endangered in the wild as populations have been reduced to less than 2,000 individuals across their native territories. The main reason for the severe decline in the dhole population numbers is thought to be through habitat loss and hunting from humans. Kung gusto pa natin makita ang mga ito, wag nating abusuin and kalikasan, sabagamat sa mga taong iba and estado sa buhay na may kayang bunili ng mga baril at magsama ng mga asu-asuhan para manghuli ng Dhole o asong gubat, kanila itong huhuliin at kakainin, kawawang mga aso nakikinig sa bakulaw para kunin ang kapwa aso, mahirap kasi ang buhay eh! makagat sana kayo ng mga hinahunting nyo! 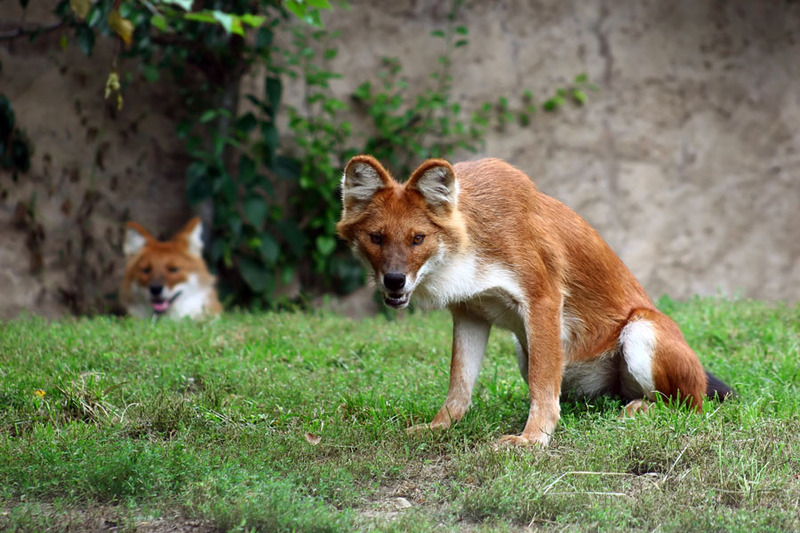 Dholes are not cool they smell like farts...bad farts.